On Camera, it has a 12MP rear camera with dual LED Flash, 1.4μm pixel size, Sony IMX363 sensor, Dual Pixel autofocus, secondary 5MP camera with Samsung sensor and 20MP front-facing camera with LED flash. Connectivity options include Dual 4G VoLTE, Wi-Fi 802.11 ac (2.4GHz + 5GHz), Bluetooth 5, GPS + GLONASS, USB Type-C Packed with a 4000mAh battery with Qualcomm Quick Charge 3.0 fast charging. 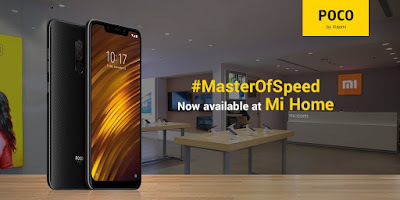 POCOF1 comes in Graphite Black, Steel Blue and Rosso Red color there is also POCO F1 Armoured Edition. Poco F1 is Priced at Rs 20,999 for 6GB RAM, 64GB Storage, Rs 23,999 for 6GB + 128GB and Rs 28,999 for 8GB RAM 256GB Storage. Armoured Edition cost Rs 29,999 8GB RAM +256GB Storage. Address: E-234, E-235, Indirapuram Habitat Center, Plot No - 16, Ahinsa Khand - 1, Indirapuram, Ghaziabad, UP,201014.